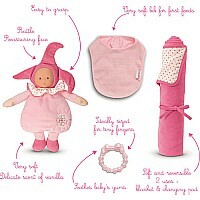 Corolle's Mon Doudou Corolle Birth Set with Pink Elf is the most complete newborn gift set to start off in the pink! 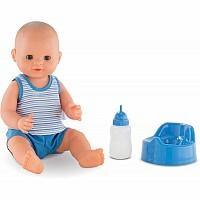 It includes an elf that jingles softly when shaken, a teething ring, a bib, and an ultra-soft reversible blanket (18.5 in. square) to help keep baby warm or to use as a changing pad. The Pink Cotton Flower Elf soft baby doll is baby's first stimulating friend: it jingles softly when shaken and has multiple grip points for baby to grasp. 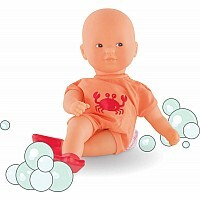 Her soft vinyl face, which is delicately vanilla-scented, captivates and reassures baby. The pink teething ring, also vanilla-scented, is perfect to soothe teething baby's gums. The soft knit bib is ideal for first feedings, and the extra-soft blanket can help to keep baby warm, be used as a changing pad while on the go or even as a blanky. 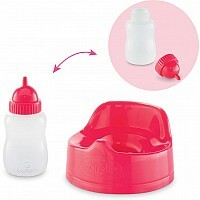 Before the first use and after each use, the teething ring should be washed in soapy water, then rinsed. Do not boil, steam, put in the dishwasher, or put the teether in the microwave. The Elf, bib and blanket comes with labels to write baby's first name or your phone number in case they are lost. They are also machine washable, delicate cycle. From birth.